As if the onslaught of commercials isn’t enough to remind us, the winter holiday season has begun. For nurses, whose patients always seem to worsen, or expire, around the holidays, jumbled feelings of anxiety and guilt may arise. 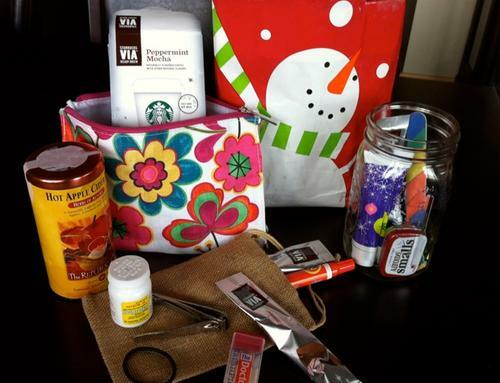 ‘Tis the season to practice extra strength self-care and creative gift giving! A package of toothpicks: Does anyone share my irrational fear of food stuck in my teeth? A laundry detergent pen or wipes to remove betadine, coffee, or blood stains from scrubs and lab coats before they set. A cheap pair of reading glasses: because who can read that tiny print on single dose medication vials? Remember to keep the supplies miniature. Collect them into a cloth drawstring bag, coffee mug, or Mason jar. Those cosmetic bags you get as a “gift with purchase” from department stores work, too. Add a bow and gift tag: voilà! If you prefer a gift for your unit while maintaining a budget, consider buying larger amounts of the supplies, and place them in a basket lined with tissue paper or gift straw, as a group gift available in the staff lounge. What items do you consider essential items for a nurse’s Shift From Hell? This entry was posted in Holiday Posts, Posts About Art & Nursing and tagged Gift, health, Holiday gifts for nurses, nurse bloggers, nurse blogs, nursing, shift from Hell, Shopping, Survival kit, the winter holiday season, Tis the season by jparadisirn. Bookmark the permalink.